Synopsis: A look at an assisted suicide clinic and its colorful inhabitants. Assisted suicide. Kevorkian brought it to our attention. And everyone has their own opinion. KILL ME PLEASE takes a look at an assisted suicide clinic run by a very compassionate yet realistic Dr. Kruger and its colorful workers and patients. First conclusion would be there's a political agenda beneath the surface, but that would be incorrect. Actually, the film lends itself as a dark comedy if anything. I know... doesn't appear to make much sense. Dr. Kruger gets patients from all parts of the world. They come to him because they just can't stand their life anymore, whether it's because of a brain tumor or losing his wife in a poker game. Sounds goofy, but director Olias Barco lets the first half of his film burn slowly as we're introduced to the ins and outs of the Kruger's clinic and the severity of his job. Not everyone is accepted to his clinic, and he actually makes a point for his patients to really think about their ultimate choice because he understands there "are very few life decisions that you cannot undo." Coupled with being shot in black and white, the film sets an ominous tone from the beginning. So patients could be there for a few days or weeks depending on their personal situations. Some patients are relatable, and some are just odd. However, each believes there isn't a better solution to their life, thus circumstances brought them here. Once the action begins during the second half, the movie takes a turn of the absurd, and the direction you assumed the plot was going gets turned completely on its head. When the credits rolled, I sat there not knowing what to make of my experience. Yes, the movie was, from a technical aspect, well shot and acted. The scenery was beautiful; the characters were somewhat fun and all had satisfying, if not slightly horrific, arcs. However, I don't know what Barco wanted to say. Was this a commentary on picking life no matter how difficult it gets? Or is this a pro-human stance where you can do with your body what you want? Are we all just victim of our circumstances, and we just have to make the best of each situation we're given? Are we really just out to save ourselves in the end? I want to conclude that Barco wanted to comment on the absurdity of even contemplating taking your life when faced with extreme circumstances, but that could just be my own projections I'm forcing onto the movie. 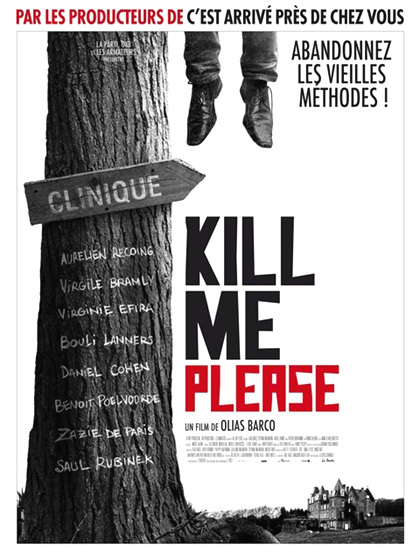 KILL ME PLEASE falls into that weird category of movies that you watch so you can discuss a topic/controversy. Even though you may know which side you stand on, this movie does make you think and talk about aspects that never occurred to you. Take that for what you will.